Gypsies, Tramps and Weeia started out with the examination of a young Weeia girl, Danni, who needs to pass in order to become the next level marshal. Weeia is creatures who appear like humans at first glance, but should they gather in a crowd, they’d stand out too much from distinctive features. They possess special powers for the purpose of protecting both humans and Weeia. When the story opens, we find that Danni’s family makes it hard to build a name for herself. Aside from a couple of faithful friends, Danni is basically paying for the sins of her family. She wants nothing more than to prove that she’s worth a second glance. She finds that chance in her first assignment: Paris. Having never been to Paris before, I felt as though I was right there. The idea of having the first assignment in Paris can make anyone walk in an excited daze. However, Danni’s excitement is short-lived when she arrives at a dirty apartment, her boss doesn’t care to meet her and she’s stuck trying to orient herself in a new, strange place. But that won’t last for too long–soon, she will be swept up in an adventure of a lifetime. The plot was well thought-out, characters three-dimensional. I truly enjoyed this fantasy story because it was different than most that I’ve read. 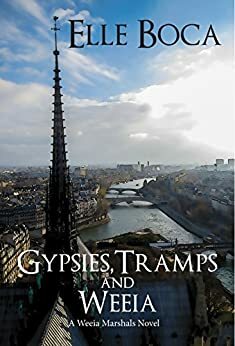 There were a few problems in the editing but still didn’t keep me from becoming immersed in this wonderful tale of Gypsies, Tramps and Weeia.